Random underlinings, ill-advised hashtags, activists posing as voters – this booklet has it all. 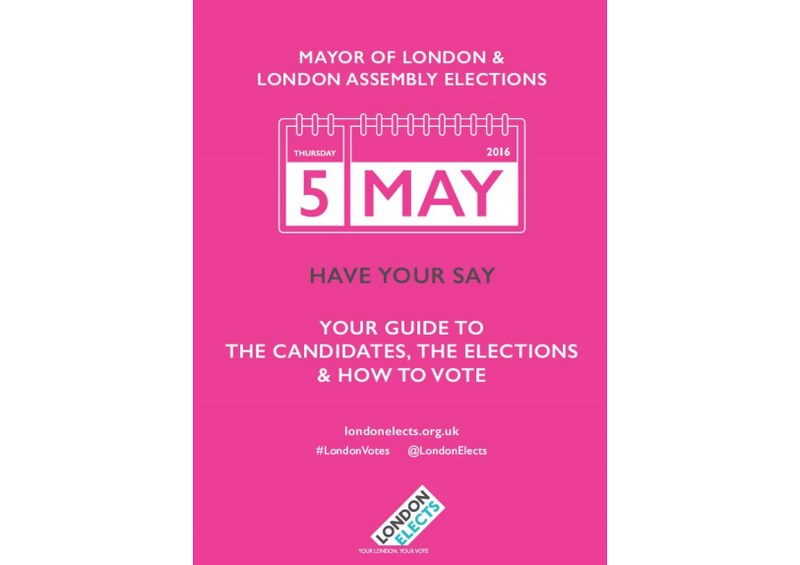 The booklet to which I’m referring is, of course, the Mayor of London’s official guide to his potential successors – a booklet where all the candidates who could be bothered to cough up £10K set out their manifestos. From the boring to the barking, it’s all in there…and I’m here to talk you through it. If you want to read along in real-time, you can download it here. 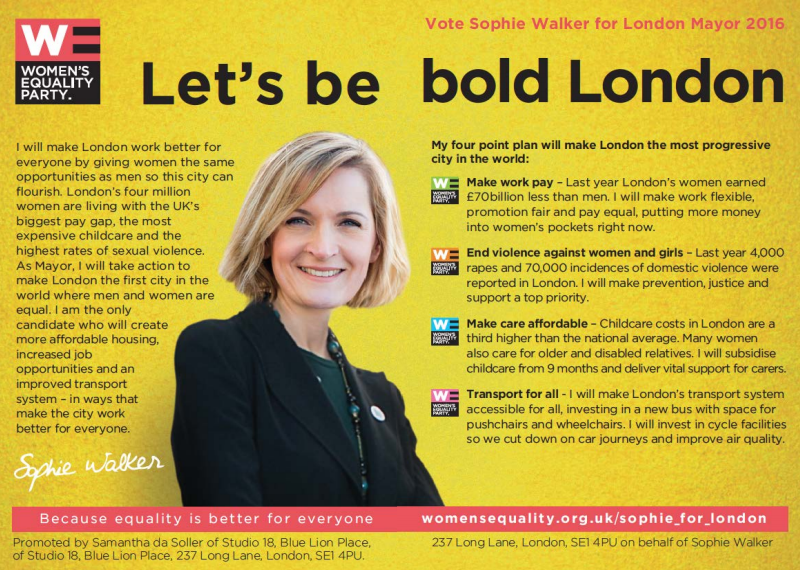 In the interests of non-partiality, we’ll go through the candidates in booklet order, which means we means we start with Sophie Walker of the Women’s Equality Party. She has some admirable ideas about ending violence against women and closing the pay gap and other things which seem the tiniest bit out of the mayoral jurisidiction. I’d love to see the pay gap closed but it might be a tad unrealistic to unpick centuries of inequality in one mayoral term. Still, good on her. I hope she does well. 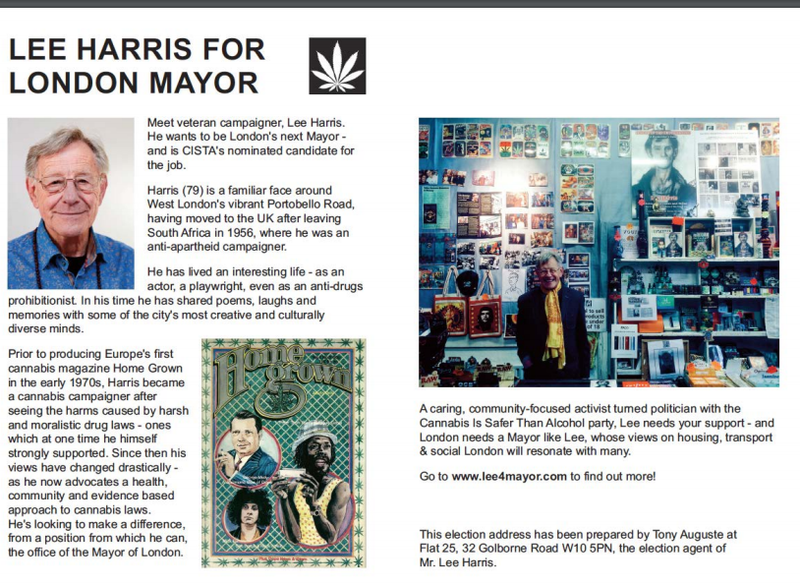 Next up is Lee Harris of CISTA – the Cannabis is Safer than Alcohol party. 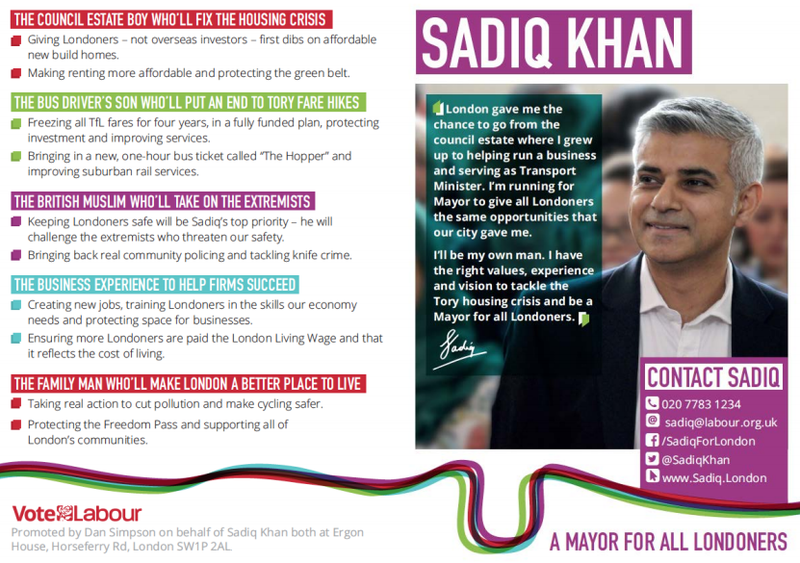 It probably is, but as London mayoral agendas go, this one’s a bit one-note. He seems like a nice old geezer and could certainly sort you out with a Che Guevara shopping bag but I need Mayor to say a bit more on housing than just “he has some views and some people will agree with them”. 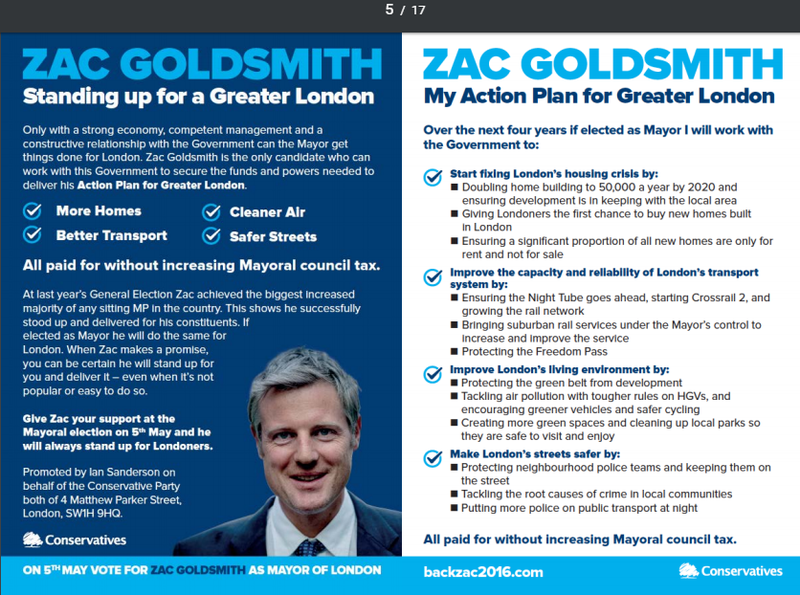 Onto our first big name – Zac Goldsmith. There’s not much I could say about the Tory poster boy that hasn’t already been said. If he gets in, we’re pretty much guaranteed Boris the Second and I’m not sure we have much use for Boris the First. 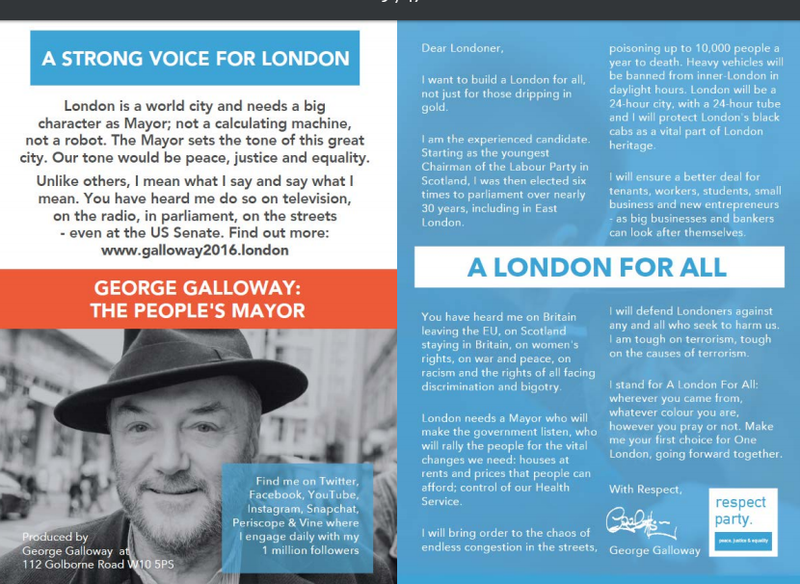 But one thing that strikes me about the prose in the booklet – the paragraph that boasts about his massive majority in the last General Election and how “he successfully stood up and delivered for his constituents”. Now, I know we all interpret these situations differently but to me, the last General Election doesn’t prove that “When Zac makes a promise he will stand up for you and deliver it” (yes, they did use the same hackneyed phrase twice in a paragraph) – it proves that he’ll stand for a job, get it and then straight away start looking for a better job. He was elected as MP for Richmond Park and North Kingston on 7th May 2015 and by 9th June 2015, he was confirming that he was hoping to trigger a by-election way before the five-year term was up. That’s the kind of commitment we’d love to see here from our mayor. Now to the BNP. And this is where it gets interesting. Almost half of their manifesto is taken up with explaining that they’re not Islamaphobic, because “Islamaphobia is..an irrational fear” and they’re totally like justified in being scared of all Muslims. Nice technicality, folks. Then there’s a twisting of the Archbishop of Canterbury’s words that I suspect would make even the holy man himself cuss. Their words are “the Archbishop of Canterbury publicly labelled it outrageous to describe people who are worried about the impact of migration as racist” If you made it to the end of the sentence, congratulate yourself, given it was more complex than a sample question in a KS1 SATS test. But let’s unpick it a little. Yes, I’m giving them more than a paragraph. Because they’re worth it. “There is a tendency to say ‘those people are racist’, which is just outrageous, absolutely outrageous. Which I think is a pretty balanced thing to say, especially as he was calling for the UK to take in more migrants, not less. 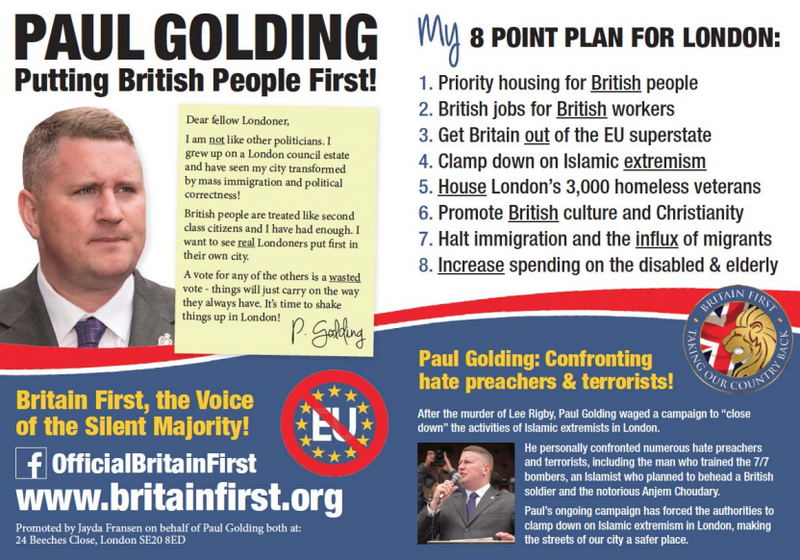 Obviously, the BNP are most concerned with labelling themselves not-racist (or Islamaphobic) and have neglected to edit out the bits of their manifesto which betray them as really being quite bigoted at heart. Like putting “refugees” in inverted commas. I’ll just let that speak for itself. That’s not the best bit though. 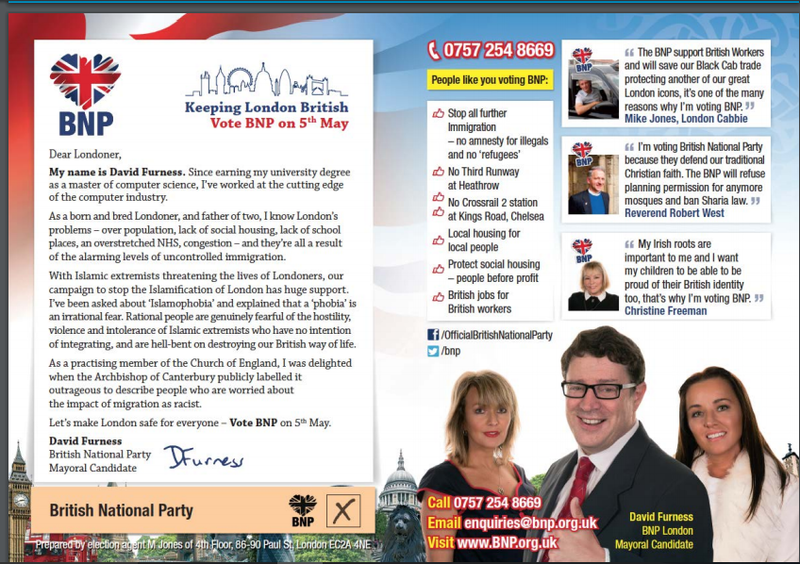 The best bit is the claim that “People like you voting BNP”. I didn’t realise that people liked or disliked my voting choices but there you go, they like it when I vote BNP. Just like these other random voters that they’ve picked off the street to telling us why they, the ordinary voters of Britain, will be voting BNP in this mayoral election. Thank you Christine Freeman, Rvd Robert West and Mike Jones. 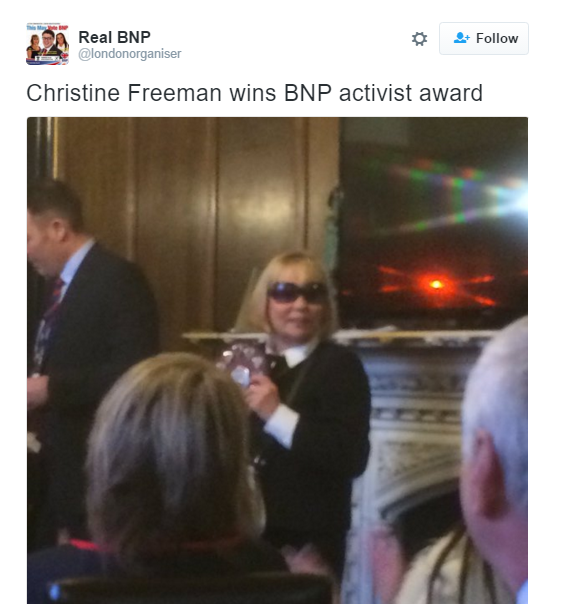 Of course, “BNP Activist of the Year” is a hotly contested award and Christine must have wrestled it out of the grip of the former title-holder, Mike Jones. Yes, the man featured in the booklet as “London Cabbie” is the BNP’s Activist of the Year 2014 and the London Regional Organiser for the party. In so many ways though, he’s just a regular man on the street. What of that Reverend though, who joins the Archbishop in implying that the BNP has the blessing of God? Well, he’s never, to my knowledge, won Activist of the Year but he is described as a BNP activist on his Wikipedia Page, and also as someone not affiliated with any recognised church other than the one he started. He also holds the post of Religious Adviser to the BNP. That’s three out of three BNP voters “like you” that are actually BNP activists. Next! 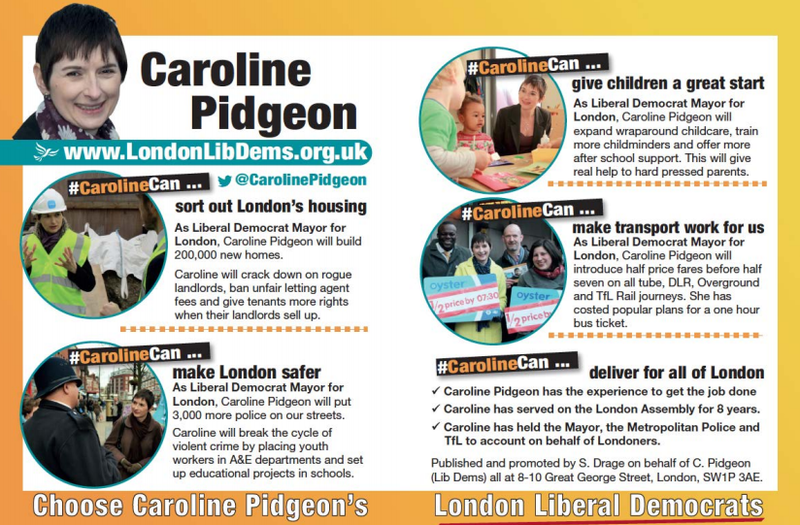 After all that excitement, it’s quite soothing to read Caroline Pidgeon’s pitch for the Liberal Democrat vote. 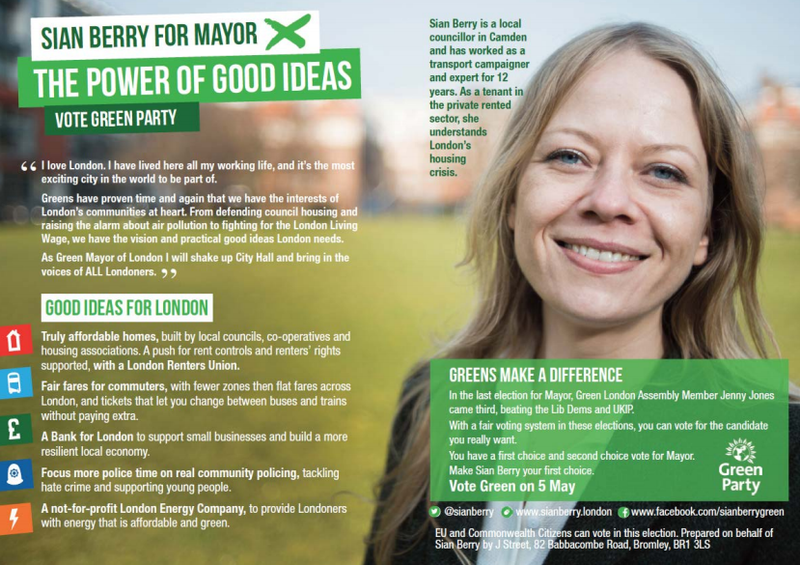 I have no problems with anything she’s saying – her policies seem sensible and her credentials are sound, given she’s actually served on the London Assembly for the last two mayoral terms. But who came up with the hashtag #CarolineCan? It’s just begging to be abused. Caroline can….do what? Juggle? Eat three Weetabix for breakfast? Stop eating Pringles once she’s popped? Those are just the polite ones I’ve thought of but I’m sure I’m not the only one tempted into mischief by such an ambiguous hashtag. No Paul, underline the adverbs. “Increase” is a verb, isn’t it? We went through this. It does make me wonder if he always talks like this, emphasizing random parts of speech all the time: “No mother I won’t HAVE a cup of tea. I just had one IN Starbucks.” Although replace Starbucks with some kind of British coffee chain that sells British coffee to British people, creating British jobs. The random underlinings quite detract from the rest of the content, which sees Paul boasting about how he’s personally tackled hate preachers and forced the authorities to clamp down on Islamic extremism. Sure you have, love. I kinda suspect that Islamic extremism would have been on the Met’s agenda even without your involvement, but that’s OK. You have your moment. Also, Paul pledges to get Britain out of the EU, so if the June referendum goes his way, you can be sure he’ll be taking personal credit. Let’s move on to George Galloway. Not much to pick apart when it comes to his views because he doesn’t really view this booklet as a place to share them. He’s already done that and spends four lines listing the places he’s shared his views – “on television, on the radio, in parliament, on the streets – even the US Senate”. He later tells us the topics he’s shared his views on – Britain leaving the EU, women’s rights, war and peace – but again fails to tell us what his opinions on those topics might be. Thanks George, that’s 10K well spent. It would be unfair of me to rip into UKIP just for being UKIP…after all, we’ve had a lot of right-wing bashing already and there’s nothing much that’ll surprise you on their page. I did note one peculiar policy though – scrapping council translation services. Obviously, it’s a blatant way to get at the immigrants who have already entered the country but it does smack of just trying to spite them for no good reason. If, as UKIP maintain, we are being flooded by immigrants surely we need more translation services, not less? Setting aside the fact that it’s a legal requirement in some situations and not really the Mayor of London’s decision in most situations, it just seems really impractical. So, UKIP, do you suggest we just ignore these immigrants when they come to the Job Centre or a hospital, talking in a language we don’t understand? Just by sticking our fingers in our ears and saying “I can’t hear you”? Or are you suggesting that we only hire public sector employees that are already multilingual so that they can easily communicate with a number of immigrant communities in their mother tongue? Now, that’s a good idea. 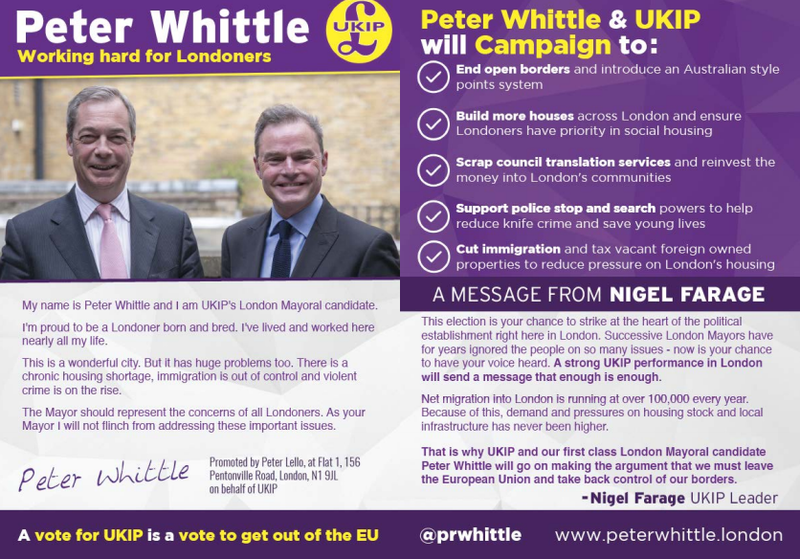 I’d back that one, Peter Whittle! So….Sadiq Khan. This is another one that I want to back but the manifesto is making it hard for me to do so. What are your actual plans, Sadiq? Your page is just full of vague statements like “Keeping Londoners safe”, “Bringing back real community policing” and “Taking real action” without saying how you’re going to do anything of those things. You have soundbites aplenty and so many mayoral profiles that you could rival David Bowie for reinvention. In thirty years’ time, I’m sure we’ll look back at Sadiq Khan’s phases as “Family Man”, “Council Estate Boy”, “British Muslim” and “Bus Driver’s Son”, as well as being his “own man” but what is he actually planning to do if he gets in? It’s looking increasingly likely that he will, but this voter would sure like to know exactly what we’re signing up to. The only solid policies I can see are the transport ones, and those I agree with…so what else have you got? 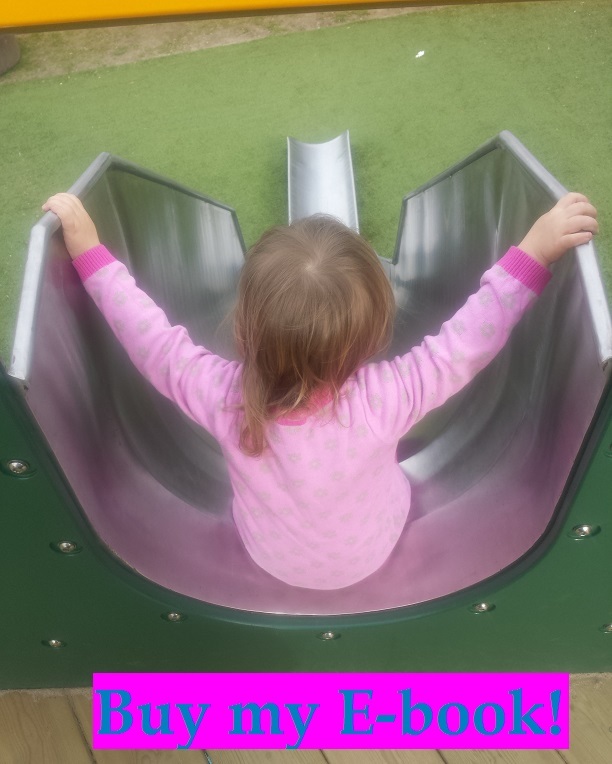 This entry was posted in Rants and tagged London, politics. Bookmark the permalink.